As a mother, doctor, and a professional food writer, I find very few times when all three of my roles come rolled into one. But one of those rare occasions is when I take my son to restaurants. These are generally during lunches/brunches, these are at family holidays and or Sunday brunches, when the idea of leaving the little one at home with his nanny is just too sad, or not possible since nanny is not on said holiday with us. 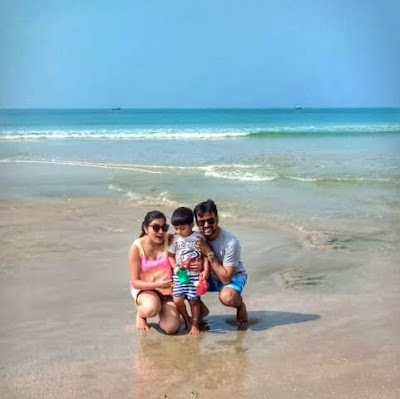 Over the past 18 months of my dsons life, we have spent almost a week at Maldives, a weekend at Mahabaleshwar, a few weekends on staycations in Goa itself, and sometimes he has accompanied me on a few of my professional food reviews. Here are my quick tips on brunching with a baby. 1. Call in advance to find out if they have a high chair. Many restaurants we have visited do not have one, and at those times we take him in the stroller which doubles as a chair for meals, or carry along the booster chair. 2. Call also to make reservations , because nothing is more danting than waiting endlessly outside an eatery with a bawling kid. 3. Choose a table which is a little apart from the other diners. These are generally in the patio, or in a recess, or on the sides. This ensures that even if your child is having a melt down, drumming on plates with his spoons, or throwing food on the floor, you are atleast not the glaring center of attention, and allow other diners a peaceful meal aswell. Seat away from the music. If carrying stroller, see that it is not blocking the path for wait staff and other diners. 4. Once baby is settled in high chair, make your rounds of the spread. 5. I ask for a plastic plate and spoon, or carry your own. 6. Immediately get something for baby to drink or munch on. If we are at a breakfast spread, I get him a small bowl of cheerios, or if at lunch I get him some peas, potatoes from the salad bar, a cupcake from the dessert counter or even boiled eggs from the cold salad. Basically something to keep him busy. 7. Then starts the long drawn process of finding something tasty,nutritious and yet baby friendly. 8. When he was barely 10 months old, we stayed at the Park Hyatt Goa, and shreyu had peas idli , for breakfast, poached fish, roti, and southern style corn bread for lunch, he even had pasta for dinner. 9. When he was 14 months we had scrambled eggs for breakfast, no cold cuts, no prawns and no uncooked fish . he enjoyed noodles, and had taken a huge liking to desserts, cakes . 10. By 16 months he was a pro and managed to sip on a straw, have his own fresh juice, attempted to feed himself with forks and spoons, and enjoyed omelettes, dosas, roast chicken, sauted chinese vegetables, new found love for mushrooms, and sweet corn. 11. By 18 months he knows what he likes and does not. he loves his fish, he is able to handle a few spicy dishes. So biryani is fine, but spicy goan curry makes him spit. He will try almost everything once. He enjoys icecream , just the way he enjoyed it at 12 months of age. 12. My point is that you hardly ever have to resort to the childrens menu, the adult menu is varied enough for children. The childrens menu is generally deep fried, high on food colourings, high on sugar, and fizzy drinks. I let my son have colourful mocktails, made with fruit juices, but not soft drinks. I let him have potato wedges, or baked potatoes, but not the hash brownies. He has just discovered his love for tomato ketchup, but is willing to try other food items along with it. thankfully he did not take a liking to these ... yet! 13. Watching him eat and enjoy the various things and my treasure hunt at every meal to find something he will like has transformed our eating outs into adventures I will treasure forever.